Throughout history, governments around the world have tried to control the prices of goods and services. These efforts have disrupted the marketplace and created shortages or excesses. But just like zombies, price controls keep rising from the dead because politicians seem to think they can create a better methodology. They never learn that price controls do not work and end up hurting the economy, consumers, and taxpayers. The latest effort to control prices is focused is on prescription drugs. Politicians in Washington, D.C., and around the country are calling for a variety of policies to control drug prices, such as restricting how much drug companies spend on research and development; capping out-of-pocket expenses; penalizing an “unjustified” price; allowing the importation of drugs from other countries; utilizing Medicaid-style rebates; and, allowing the secretary of the Department of Health and Human Services (HHS) to “negotiate” prices for Medicare Part D.
There have been efforts within Congress and state legislatures to enact “transparency” legislation to force pharmaceutical companies to release reams of proprietary information, such as the details of clinical trials and regulatory costs; manufacturing and administrative outlays; and acquisition, patent, and licensing costs in a supposed attempt to understand how drugs are priced. It is understandable that patients, insurers, and politicians react passionately to high costs, but more competition, not price controls, will resolve this matter. The added benefit of competition is more research and innovation, which otherwise would be hampered with price controls. In 2000, Citizens Against Government Waste released, Price Controls on Drugs: Hazardous to Your Health. At that time, President Bill Clinton was considering the creation of a prescription drug benefit for Medicare beneficiaries. Although his plan did not specifically call for price controls, the proposed pricing mechanisms would have yielded such a result. For example, the Clinton plan would have allowed the Health Care Financing Administration (HCFA) [now the Centers for Medicare and Medicaid Services] to utilize only one pharmaceutical benefit manager (PBM), after a bidding process, for each of 15 defined geographic areas. HCFA could even have decided to utilize one PBM to oversee several regions, creating a monopsony, a situation in which one purchaser is so large it controls the price. Such a proposal, had it been implemented, would have stifled competition and limited access to some pharmaceuticals while giving more control to government bureaucrats. Fortunately, the Clinton proposal was not passed into law. With the 2016 presidential election on the immediate horizon, drug prices remain a hot-button issue. Both former Secretary of State Hillary Clinton (D) and Donald Trump (R) have offered drug-pricing proposals. For example, former Secretary Clinton has called for controls on pharmaceutical research and development and Medicaid rebates for low-income Medicare beneficiaries. Both candidates have called for the government to “negotiate” drug prices in Medicare Part D and allow importation of drugs from abroad. Despite the implication that no price negotiations occur in Medicare Part D, it is not true. PBMs administer prescription drug plans and negotiate every day with pharmaceutical companies and pharmacies to find the best deal for the clients they serve: Medicare beneficiaries, the Federal Employee Health Benefits Program (FEHBP), insurers, unions, and companies that provide health plans for their employees. They use a variety of tools, such as mail order delivery; creating networks of more affordable pharmacies; encouraging the use of generic drugs; negotiating rebates from manufacturers; reducing waste; and counseling patients to take their medications in order to stay healthy and lower healthcare costs. Medicare Part D was signed into law on December 8, 2003, and the Congressional Budget Office (CBO) predicted in 2005 that the benefit would cost the government $127 billion in 2012; however, its cost in that year was $55 billion. Compare that result to Medicare Parts A and B, which use government price controls to pay providers. In 1967, the House Ways and Means Committee predicted the entire Medicare program would cost taxpayers $12 billion in 1990; its cost that year was $98 billion. Some politicians argue drug importation is a trade or “free market” issue, but it is not. Importing another country’s drugs because the prices are lower is simply importing that country’s price controls. Furthermore, it is unlikely a research-based pharmaceutical company will ship more drugs to a foreign country, such as Canada, than its population needs. It is also unlikely that Canadian pharmacies will ship their supplies of drugs to U.S. markets without increasing prices. Even worse, allowing importation would encourage unscrupulous actors to utilize counterfeit drugs made in third-world countries, camouflage them as Canadian prescription drugs, and ship them to unsuspecting Americans. In their 1978 book, Forty Centuries of Wage and Price Controls, authors Robert Scheuttinger and Eamonn Butler ably demonstrated that price controls are damaging, whether utilized in 2150 B.C. or 2016 A.D. From the Babylonian Code of Hammurabi, to President Nixon’s Economic Stabilization Act, to rent control in San Francisco and New York, the authors laid out how price controls interfered with the marketplace, caused shortages, and hurt the very population they were intended to help. North pointed out that, even after this first failed attempt at price controls, similar restrictions were adopted in subsequent years. In 1633, magistrates imposed a general profit margin of 33 percent on any imported good, but added a clause that warned citizens against violating the “intent” of the law forbidding “excessive wages” and “unreasonable prices for such necessary merchandise or other commodities as shall pass from man to man.” Those who violated the intent of the law would be punished with fines or incarceration. The law gave enforcement agents broad discretion to determine the meaning of “intent” and “excessive,” which led to “a considerable degree of uncertainty in economic exchanges.” The law was repealed two years later. Finally, after even more attempts by colonial leaders to control prices, in 1650 there was a relaxation of economic regulations. As trade grew, so did market transactions, and the colonists benefitted from more competition, more specialized production, greater economic productivity, and lower prices. Although the executive order was only supposed to last for 90 days, several iterations were implemented: Phases Two, Three, and Four. After Phase Four was executed on August 12, 1973, Secretary of the Treasury George Schultz announced that the goal of the administration was to reduce inflation to 3 percent per year or less. Phase Four lasted nine months and, during that time, the Wholesale Price Index (WPI) went up by 18.3 percent and the Consumer Price Index (CPI) went up at an annual rate of 11.4 percent. From August 15, 1971 to April 30, 1974, the entire length of the Nixon price controls, the WPI and CPI increased at annual rates of 12.0 and 7.2 percent, respectively. In the 12 months before price controls were implemented, the WPI and CPI had annual rate increases of 3.3 and 4.3 percent, respectively. Perhaps the most striking impact of Nixon’s decision was the evasive action that followed in numerous industries. For example, with price controls in place on conventional cuts of beef, grocers invented new cuts of beef, such as the “watermelon roast,” which did not fall under price controls. Lumber producers took advantage of a loophole for imported lumber, which was exempt from price controls. They simply exported lumber to Canada and then imported it back into the United States. Another loophole was created for “customized” work. Enterprising contractors drilled holes in plywood, then filled the holes back up again to create a customized product. While some evasive maneuvers were clever and successful, others were almost tragic. Cattle were withheld from the market, driving up the cost of beef; baby chickens were drowned; and, food shelves were sparsely stocked. Other, perhaps more memorable examples of price controls, were the gas shortages of the 1970s. Because price controls lead to distortions in the marketplace, the government’s regulatory systems often promulgate layers of complex rules to address the irrational behavior resulting from them. Although domestic oil prices were under a price control regime, the cost of foreign oil had been left free to rise and fall based upon market conditions. Because refiners had access to domestic and foreign oil in different proportions, the Nixon administration sought to equalize their costs. Thus, its Cost of Living Council created a two-tier pricing system to equalize the price of all petroleum products from refiners. Prices for foreign oil and domestic oil from “new” wells were allowed to rise while oil from “old” domestic wells were controlled. This intervention in the conservation and allocation of oil supplies caused Americans in various regions of the country to line up for hours to get access to gasoline. Another adverse impact of price controls was a greater reliance on imported oil. In October 1973, when the OPEC nations announced an oil embargo to countries that had given assistance to Israel during the Yom Kippur War, gas shortages, price gouging, and long lines at the pumps became even more pervasive. Drivers looked for green flags outside service stations, which signaled gas was available; license plate numbers determined what day consumers could buy gas. Most price controls ended by April 1974, but the control of oil prices was transferred to the Federal Energy Office. Instead of getting rid of price controls, Congress decided to “punish” oil companies in 1976 for continued high prices and extended price controls indefinitely. The price controls further discouraged domestic production of oil and encouraged even greater reliance on foreign oil that often came from unstable parts of the world. With energy costs still high and an increased reliance on foreign oil, President Carter asked Congress to turn the Federal Energy Office into the U.S. Department of Energy. His administration then increased the fuel efficiency mandates created under the Nixon administration, pumped billions of tax dollars into alternative energy, and required energy savings standards on home appliances. Millions of dollars were wasted on projects that were not economically sound, such as coal gasification. The end result was that oil consumption rose from less than 15 million barrels a day in 1970 to more than 18 million barrels a day in 1979. The 1979 Iranian oil crisis, caused by the Iranian Revolution, suppressed output and pushed gas prices higher. Panic ensued and lines began to form at gasoline pumps. In an effort to make more fuel available, Carter began to dismantle the price controls on oil and gasoline. Prices quickly rose and businesses passed along their costs, which helped to create sky-high inflation; and unions demanded large cost-of-living increases. The Federal Reserve, reacting to the crisis, increased interest rates, which plunged the nation into a recession. When President Reagan entered the White House, one of the first actions he took was to remove the oil price controls and abolish approximately 200 energy regulations. Over time, consumption and oil prices fell in real terms as domestic oil production increased for the first time in 10 years. The free market did more to control the price and improve access than any government program. What did America reap from its brief fling with economic controls? The August 15, 1971, decision to impose them was politically necessary and immensely popular in the short run. But in the long run I believe that it was wrong. The piper must always be paid, and there was an unquestionably high price for tampering with the orthodox economic mechanisms. President Obama promised lower costs and greater accessibility if the Patient Protection and Affordable Care Act (ACA), or Obamacare, became law. The opposite has happened. While the federal government has engineered insurance premiums and insurers’ profits, promising less strain on everyone’s wallets, in reality Americans are experiencing higher premiums, sky-rocketing deductibles, and large out-of-pocket costs. On October 24, 2016, HHS announced that the average premium increase for the benchmark Obamacare plan would be 25 percent. Under free-market conditions, younger people would pay less for health insurance because they tend to be healthier and utilize fewer services compared to those in their late sixties. Prior to Obamacare, some form of community rating was mandated in 18 states to spread risk across the community and people paid the same rates no matter their health status or factors such as age or gender. In the states that used community rating, insurance premium costs were higher. Under ACA’s adjusted community rating, insurers can adjust insurance premiums based on only four factors: individual or family enrollment; geographic area; age; and, tobacco use. With respect to age, the law will not allow insurers to charge an older adult more than three times the rate charged a younger person. This policy has driven up health insurance premiums for younger, healthy people, particularly those between the ages of 18 and 30, to the point they would rather pay a fine than purchase insurance. According to March 2016 data from the Centers for Disease Control and Prevention’s National Center for Health Statistics, approximately 16 percent of Americans aged 25 to 34 do not have health insurance and 14 percent of those between the ages of 35 to 44 are also without coverage. Yet, these are the very participants Obamacare needs in order to stabilize the marketplaces. Younger purchasers know a bad deal when they see it and are rejecting the high premiums and deductibles. In addition, the four compulsory cost-sharing metallic plans, Platinum, Gold, Silver, and Bronze, dictate actuarial value costs. Under a Platinum Plan, the insurer is required to cover about 90 percent of healthcare costs; under Gold about 80 percent; under Silver about 70 percent; and, under Bronze about 60 percent. In each case, consumers pick up the rest of the costs, which can vary depending on whether they qualify for government subsidies. Obamacare controls the amount an insurer spends from premium dollars on claims, administration, and profits, known as the medical loss ratio (MLR). The law requires health insurers that cover individuals and small businesses to spend 80 percent of premium funds on covering healthcare claims and 20 percent on administration. For insurers covering large group plans, the MLR is 85 percent. If insurers fail to meet their MLR benchmark, they must pay a rebate to their customers. For 2015, the average rebate amount was approximately $129 per family, or less than $11 per month. An insurer’s revenue will vary from year to year, depending on the number of patients and cost of claims. America’s Health Insurance Plans (AHIP), the national association representing the health insurance industry, cautioned in 2012 that administrative costs are not driving healthcare costs and capping them would make it more difficult to improve care. Items such as deterring fraud, credentialing in-network providers to make sure they provide quality care, and providing patients with online and mobile access to claims histories are considered administrative costs and, therefore, fall into the 20 percent side of the ledger. The industry argues that capping these types of improvements would hurt healthcare delivery. In spite of all the evidence that price controls do not work at any time or for any purpose, politicians and advocacy groups are still clamoring to place them on pharmaceuticals. Proponents have been spreading false narratives that there is no regulation in drug pricing and somehow pharmaceutical companies have free rein to do whatever they want, or that Obamacare left the pharmaceutical industry unscathed. To the contrary, U.S. pharmaceutical companies have been dealing for years with a variety of price control measures, such as Medicaid rebates and the 340B discount program, which were intensified under Obamacare. These price control measures, among others, have distorted the market, shifted costs, and stifled innovation. In 1990, congressional hearings were held on prescription drug pricing for Medicaid. Focus was placed on the lower-than-average prices the Department of Veterans Affairs (VA) had obtained since World War II from some drug companies. Members of Congress, led by Sen. David Pryor (D-Ark. ), chairman of the Special Committee on Aging and a member of the Senate Finance Committee, queried witnesses as to why similar prices were not provided to state Medicaid drug programs. At that time, coverage of prescription drugs was an optional Medicaid service provided by all states and the District of Columbia with a federal upper payment limit and there was no requirement that manufacturers sell drugs through the Federal Supply Schedule (FSS) or VA depots at discounted prices. New Medicaid pricing bills were introduced which proffered several policy options, such as restrictive formularies and a requirement that drug manufacturers provide rebates to the state Medicaid programs based on best price and average manufacturer price (AMP). During these hearings, there were warnings that implementing price controls would be counterproductive. For example, during a September 14, 1990, House Energy and Commerce Committee hearing, a discussion ensued about how and why some pharmaceutical companies had given the VA discounts of between 41 and 67 percent off the average wholesale price for single-source drugs and 39 to 93 percent for multi-source drugs. The witness replied that, although some pharmaceutical companies’ prices to the VA were close to their commercial prices, others companies had given sizable discounts because the VA represented only 1 to 2 percent of the total U.S market. The witness characterized the lower prices as an “historical anomaly that has evolved from World War II efforts to bolster the government’s access to needed medicines.” However, he cautioned, if these lower prices were utilized to determine the best price available to calculate Medicaid discounts, the hefty discount would affect a larger percentage of total sales, as much as 15 percent. Offering such a discount would no longer be “commercially reasonable for a broader sector of the market.” Discounts at this scale could not be absorbed by many companies, thus forcing cuts to research and development, layoffs, and/or price increases. Sen. Chafee’s warning was prescient. The substantial discounts to the VA and other healthcare entities ended. Many companies that had given steep price reductions to the VA could not absorb the costs of the rebates based on an expanded “best price” without harming their businesses. Another way to think of this result is as follows: suppose a grocer decided to give returning veterans and their families a 40 percent discount on certain groceries. Since veterans’ families represented only 1 percent of the grocer’s total business, the cost could be absorbed. Suddenly, the grocer’s state legislature declares that, if this price were offered to veterans, the same price must be offered to other deserving customers. Now the population receiving the lower price makes up 10 to 15 percent of the grocer’s total sales. The only ways the grocer could prevent such a hit to the business’s bottom line is to stop providing discounts to veterans or to raise costs and cut workers. It wasn’t long before the results of this faulty legislation became evident. Drug prices to the VA increased but, rather than blame the law they had passed and their misunderstanding of economics, members of Congress were at it again within a year, trying to “fix” the problem they had created in the marketplace. Several bills, debated in both the House and Senate, were merged into a compromise bill, the Veterans Health Care Act of 1992 (P.L. 102-585), which was signed into law on November 4, 1992. The law created two new price-controlled systems, the VA Federal Ceiling Price (FCP) Program and the 340B drug discount program. The law also excluded these drug prices from the Medicaid rebate calculus. Although many will claim the VA “negotiates” drug prices, it does not; the prices charged to the VA are based on statutorily mandated prices and discounts. The Veterans Health Care Act requires pharmaceutical manufacturers to list covered drugs on the FSS and that their prices be no greater than 76 percent of the non-Federal Average Manufacturer Price (non-FAMP), minus any additional discounts as determined each year. This cap on pricing applies to purchases made by the VA, the Department of Defense, the Public Health Service (including the Indian Health Service), and the Coast Guard, which are often called the “Big Four.” If a manufacturer does not comply with P.L. 102-585, it cannot sell drugs to any of the Big Four and Medicaid. The VA also uses other price-controlled formulas. For example, under the FSS, the prices are the lowest prices that manufacturers charge their most-favored customers. Sometimes these prices are lower than the FCP. Greater discounts can be obtained under blanket purchasing or performance-based incentive agreements for an additional discount of between 5 to 15 percent of the FSS price. The VA chooses the mechanism that provides the lowest price on a case-by-case basis. However, the VA’s price-controlled drugs and strict formulary result in fewer choices for veterans compared to those received by Medicare Part D beneficiaries and federal government employees through the FEHBP. The VA is a closed system run by government employees; however, the federal government acts as an administrator in Medicare Part D and FEHBP, in both of which private healthcare plans compete with one another and provide the benefits. An October 2013 Lewin Group study compared the VA national formulary with the two highest- enrollment plans in the Medicare Part D and FEHBP drug plans. The study found that Medicare Part D and FEHBP drug plans provided “greater breadth of drug coverage than the VA formulary.” For example, only 78 percent of the 274 most-prescribed drugs in the U.S. are in the VA formulary. However, the two most popular Medicare Part D plans covered 97 and 95 percent of the drugs, respectively. FEHBP covered 91 percent of the 274 drugs. In addition, the two highest enrollment Part D plans and FEHBP did not impose prior authorization, step therapy (starting with the less expensive therapy and proceeding to a newer, riskier, or costlier drug if the first did not work as hoped), or quantity limit requirements on the majority of the 274 drugs. The VA was not the only organization that received special discounts from pharmaceutical companies prior to the 1990 Medicaid rebate legislation. Some federally-funded clinics and hospitals that served large numbers of low-income and uninsured patients also received large discounts and donations from pharmaceutical companies. Since the Medicaid rebate law required these discounted prices to be included in the overall rebate calculus, the recipients saw their generous discounts or free medications disappear as well. The 1992 VA legislation attempted to correct the problem by establishing a new provision in the Public Health Service Act (PHS), Sec. 340B, which required drug companies to give certain “covered entities” the same discounts as those given to Medicaid. These entities included such federally-funded facilities as community health centers, black lung clinics, tuberculosis clinics, and hemophilia treatment centers. Also included were certain disproportionate share hospitals (DSH), which are hospitals that receive extra government funding depending on the number of low-income Medicare and Medicaid patients they treat, as well as uninsured indigent patients. Congress intended that the savings from the discounted drugs would allow the covered “entities to stretch scarce Federal resources as far as possible, reaching more eligible patients and providing more comprehensive services.” However, because the law did not require covered entities to pass along drug savings to their patients and the definition of a 340B patient has been broadly interpreted, the program has been used by hospitals and pharmacies primarily as a profit-making scheme. The 340B program has been particularly detrimental in the field of cancer care. Due to the lack of a clear definition of 340B-eligible patients, such as whether they have insurance or the ability to pay, 340B hospitals have utilized the program as a way to generate revenue. By purchasing oncology physician offices, the 340B hospitals can administer their heavily discounted cancer drugs to newly-acquired insured outpatients, accept their co-pays, and charge insurers the full reimbursable price, pocketing the difference. As a result, the locations where patients receive chemotherapy infusion has dramatically shifted from lower-cost physician offices to higher-cost hospital outpatient settings. The ACA has made the market distortions caused by these programs worse by increasing the Medicaid rebate amount from 15.1 percent to as much as 23.1 percent for brand-name drugs and from 11 percent to 13 percent of the AMP for generic drugs. The ACA also expanded the types of covered entities that can participate in the 340B discount program. In addition, in 2010, the Health Resources and Services Administration (HRSA), the agency that oversees the 340B program, allowed covered entities to use a limitless number of contract pharmacies to fill patients’ prescriptions, even though the statute does not permit the agency to do so. 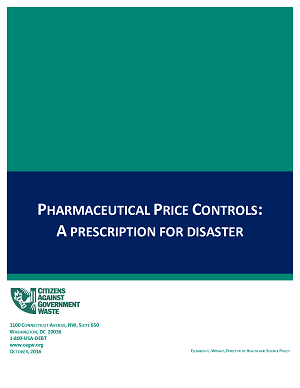 Price control measures such as Medicaid rebates, the 340B program, and the VA pricing structures have distorted the pharmaceutical market and caused price shifting. In a November 4, 2010, letter to then-House Budget Committee Ranking Member Paul Ryan (R-Wisc. ), the CBO confirmed that Obamacare’s increased Medicaid discounts and mandated new Medicare Part D discounts in the cover gap (more commonly referred to as the “donut hole” between the end of initial coverage and the start of catastrophic coverage), would likely cause manufacturers to raise prices to offset the costs of new discounts. Markets respond to pricing pressure as if it were an inflated balloon: push down on one side and the other expands. It should come as no surprise that some drug costs are being shifted to the private sector because of government price controls. The best way to lower consumer prices for pharmaceuticals is to encourage a vibrant, competitive marketplace, not overlay more government intervention in drug pricing. Using modern scientific methods and improving performance at the FDA would enable research-based and generic pharmaceuticals to enter the marketplace faster. It takes between 10 and 12 years to collect the clinical data necessary to submit a New Drug Application (NDA) before receiving FDA approval, at an average cost of $2.6 billion per approved compound. Generic drug manufacturers also face expensive roadblocks. In June 2015, there was a backlog of more than 4,000 Abbreviated New Drug Approvals (ANDAs), the process generic drug manufacturers undertake to get their products to the marketplace. Research-based and generic companies pay user fees to get their drugs approved in a timely manner. Congress passed the Prescription Drug User Fee Act (PDUFA 1) in 1992 after hearing from constituents that the FDA approval process took too long and was far slower than in many European countries, particularly with AIDS/HIV drugs. The law allowed the FDA to collect user fees from drug manufacturers to fund the approval process for a new drug. In exchange for the funding, the FDA must meet certain performance targets. A similar user fee law for the generic drug industry, the Generic Drug User Fee Amendments (GDUFA), was signed into law in 2012. Both user fee laws need to be reauthorized every five years. In 2017, the cost for a research-based drug company to submit an NDA with clinical data will be $2,038,100 and a generic firm will pay $70,480 for an ANDA. Companies also pay many other charges, such as establishment and supplement fees, to get their drugs approved. PDUFA stakeholders are generally pleased with the user fee law, under which the FDA review process has become faster and more efficient. On March 29, 2016, the California Life Sciences Association and the Boston Consulting Group released an analysis which demonstrates that FDA review times have dropped from an average of 21 months in 2009 to 10 months in 2015. The fastest reviews have occurred with oncology, infectious diseases, and rare disease drugs. On the other hand, generic firms have been more critical of GDUFA’s implementation. The law’s three main goals were to ensure safety, access, and transparency. By December 2014, the FDA had hired almost 1,000 new employees, a year ahead of schedule according to Center for Drug Evaluation and Research Director Janet Woodcock. She stated that the new hires would help approve most ANDAs within 10 months. In 2011 when GDUFA [negotiations] began, median review time to approval was at 30 months. Since then, median review times increased to 31 months in FY2012, 36 months in FY2013 and an estimated 42 months in FY2014. At the industry’s best estimate, current fiscal year median approval times will be 48 months – the slowest it has ever been. Too many generic drug applications including potential first generics have been sitting with the Agency for many years before being picked up by a reviewer. These delays contribute significantly to rising health care costs and impact access to pharmaceuticals for millions of patients. GDUFA required the FDA to review and take regulatory action on 90 percent of the ANDA backlog by September 2017. The agency recently claimed it had met that goal a year ahead of time. But that does not mean consumers can expect a flood of generic drugs to enter the marketplace. According to the Regulatory Affairs Professionals Society, the FDA continues to seek more information from companies or require them to fix easily correctable deficiencies for the vast majority of ANDAs. In fact, by July 2016, the FDA rejected far more ANDAs than it approved. In other words, most of the action taken by the FDA was to return the majority of ANDAs to the manufacturers for more information or corrections. According to the GPhA, the current backlog at the FDA stands at more than 3,100. In an August 31, 2016, press release, GPhA noted that the FDA and the industry had reached agreement on a package of program enhancements and resource commitments to reauthorize GDUFA in 2017. Key provisions include addressing the ANDA backlog; providing priority, as opposed to standard review, for generic drugs where there is no competition; FDA performance reporting; and, enhanced communications between the agency and manufacturers. Only time will tell if the FDA lives up to expectations and approves generics in a timely way. It will be up to Congress to hold the FDA’s feet to the fire to make sure these goals are met. While user fees have sped up the drug approval process, at least in regard to the NDAs, they are certainly not a panacea. A 2014 Manhattan Institute study entitled, “An FDA Report Card: Wide Variance in Performance Found Among Agency’s Drug Review Revisions” found that some divisions within FDA’s Center for Drug Evaluation and Research (CDER) have a better performance record than others. The report called for the FDA to determine what is working in its high-performing drug divisions and promote the adoption of these best practices throughout the rest of the agency to improve efficiency and expedite drug approvals, and to brief Congress on a regular basis on their quality improvement efforts. The report also called for more FDA transparency, such as continual self-examination of approval delays and denials in order to address what caused these actions, or even an inaction. When the agency does not have in-house expertise to review complex new technologies, it should augment FDA staff by utilizing personnel from other trusted organizations, such as the National Institutes of Health, the Critical Path Institute, or the Reagan-Udall Foundation. The report noted that the FDA must be prepared for innovations in medical science and the development of new therapies, such as personalized medicine, in which a drug will be developed based on an individual’s genome. New thinking and new methods will be required to approve these drugs because for many years pharmaceutical research and development was one-size-fits-all. Thousands of people were tested in clinical trials to obtain evidence that the drug benefited more people than it did not. With the new technologies that utilize the human genome, researchers will be able to quickly discover which drugs will work best on particular individuals. Biotechnology and the mapping of the human genome allows researchers and doctors to fight diseases at the molecular level. Government policy must not lag behind these pioneering treatments. Certain research tools and methods, such as biomarkers and surrogate endpoints, will help to speed up clinical trials and the drug approval process, thus improving patient access to life-saving pharmaceuticals. In addition, patient experience data and allowing more patients in clinical trials should become part of the regulatory approval process. These ideas and others are addressed in H.R. 6, the “21st Century Cures Act,” a bill that passed the House of Representatives in July 2015, but is still under consideration in the Senate. A biomarker may be as commonplace as monitoring blood pressure when evaluating a patient’s response to an antihypertensive drug; or more complex and genetically-based, such as a gene mutation that determines a patient’s risk for breast cancer, or one that causes a particular kind of leukemia that can be targeted and eliminated by a powerful drug, sparing healthy cells in the process. A surrogate endpoint, such as the reduction in size of a tumor, can be used by the FDA to quickly approve a new cancer drug rather than waiting several years to determine a survival rate. A January 2015, House Energy and Commerce Committee whitepaper entitled the “21st Century Cures Discussion” noted that the FDA already has broad authority to use biomarkers and surrogate endpoints and has done so to expedite drug approvals for life-threatening diseases. By codifying their use and requiring the FDA to issue guidance to assist with the development and identification of more biomarkers and surrogate endpoints, as well as providing for collaboration outside the agency, biomarkers and surrogate endpoints could be used to enhance drug development and speed up even more approvals. H.R. 6 also brings patients into the drug approval process because “no one understands a particular condition or disease better than patients living with it.” The bill would establish a framework to collect meaningful patient experience data, such as an assessment of desired benefits and tolerable risks, and incorporate them into the regulatory approval process. It would also allow a more open process so that additional patients could learn about and possibly participate in investigation of drugs going through clinical trials. Many provisions in H.R. 6 are contained in PDUFA 6, which is scheduled for reauthorization in 2017. Additional bills such as H.R. 3012, “The Right to Try Act,” introduced in July 2015, and S. 2912, “The Trickett Windler Right to Try Act,” introduced in May 2016, could provide greater access to life-saving drugs for patients with terminal diseases. The bills would prevent the government from restricting access to an investigational new drug that has completed Phase 1 clinical trials for safety, but has not yet been approved by the FDA. State governments across the country are not waiting for Congress and have implemented right-to-try laws to allow terminally ill patients access to investigational drugs. According to the Goldwater Institute, which is leading the charge on right-to-try laws, the FDA grants compassionate use exceptions for approximately 1,000 patients a year. The right-to-try laws are attempting to expand that number. So far, 32 states have right-to-try laws in place. There are also calls for reciprocity of regulatory approvals between the U.S. and a select group of countries. Sens. Ted Cruz (R-Texas) and Mike Lee (R-Utah) have introduced S. 2388, the Reciprocity Ensures Streamlined Use of Lifesaving Treatments (RESULT) Act, which would amend the Food, Drug, and Cosmetic Act. The legislation would require the FDA to approve a drug application from a sponsor within 30 days if the drug were already approved and sold in certain developed and trustworthy countries, including Australia, Canada, the European Union (EU), Israel, and Japan. If a promising application for a life-saving drug is declined by the FDA, Congress can override the FDA decision by a majority vote on a joint resolution. According to Sens. Cruz and Lee, the legislation would allow Americans suffering from chronic and life-threatening conditions to access drugs which are already saving lives in developed countries but are not yet approved in the U.S.
S. 2388 has both critics and fans. In a December 11, 2015, Regulatory Affairs Professionals Society article, Larry Stevens, a former FDA official and consultant with the Massachusetts-based FDA Group, was quoted as saying while the bill “sounds good,” reciprocity will not work because “no developed country has the expertise to review a product like the FDA does” and that, if Congress should override an FDA decision, it would be responsible for the drug’s safety. But Hoover Institution Senior Fellow Henry Miller, M.D., a former FDA drug reviewer and founding director of the FDA Office of Biotechnology, believes reciprocity is an antidote for escalating drug prices. He cites the drug pirfenidone, which is used to treat a pulmonary disorder called idiopathic pulmonary fibrosis, a disease which kills thousands of Americans annually, as an example of FDA’s lassitude and hyper-cautiousness. The drug was approved in Japan in 2008, in Europe in 2011, and in Canada in 2012. An FDA advisory committee recommended approval in 2010, but the FDA requested another major clinical study. The FDA approved the drug in October 2014. More than 150,000 patients died between 2010 and 2014. In a February 14, 2014, Health Affairs blog, “If a Drug is Good Enough for Europeans, It’s Good Enough for Us,” Manhattan Institute Center for Medical Process Director Paul Howard expressed his support for reciprocity. He cited a deadly bacterial meningitis outbreak (serogroup B) at Princeton University in 2013. Meningitis is an acute inflammation of the protective membranes of the brain and spinal cord, which is caused by a virus, bacteria, or other microorganisms. The mortality rate for bacterial meningitis in the U.S. is 10 percent. Although a vaccine named Bexsero was approved in the EU for this particular strain of meningitis, it was not available in the U.S. because it was still in clinical trials. Nonetheless, Princeton received permission from the FDA to obtain Bexsero and vaccinated students and faculty within nine months of the outbreak. The FDA approved the drug in January 2015. The Cruz-Lee bill, or provisions within the bill, certainly could gain more support if the reauthorized user fees do not produce the expected results, the approval process at the FDA slows down, and the reforms found in the 21st Century Cures Act do not come to fruition. Competition and market forces, not price controls, will drive down drug costs and will do so better than any heavy-handed legislation or regulation. In early 2014, reactions to drug prices reached a fever pitch after Gilead announced its $84,000 list price tag for a 12-week course of the hepatitis C drug Sovaldi and reached a crescendo when Turing Pharmaceuticals, led by former hedge fund manager Martin Shkreli, raised the price of its drug Daraprim from $13.50 a tablet to $750 in September 2015. Prices for Gilead’s hepatitis C drug began to drop when AbbVie began to market its hepatitis C drug Viekira Pak in early 2015. In January 2016, the FDA approved Merck’s hepatitis C drug Zepatier; it was priced approximately 35 percent below Gilead’s price. In addition, drug companies, PBMs, and other healthcare providers negotiate lower pricing agreements based on volume and other factors, such as formulary placement. Unfortunately, there is little discussion about the other side of the ledger: how much the hepatitis C drugs save in future medical costs by curing people of a chronic disease and keeping them out of the hospital, making liver transplants unnecessary, and allowing patients to become productive citizens. A September 26, 2016, Inside Health Policy article noted usage of hepatitis drugs dropped by 40 percent among Medicaid patients in 2015. While the introduction of AbbVie’s drug in early 2015 brought down costs, usage apparently fell due to the Gilead drug’s 90 percent cure rate. Patients who took Gilead’s drug in 2014 were cured and did not need to continue to take the drug in 2015. Since AbbVie’s hepatitis cure rate is between 97 and 100 percent, it is likely this trend will continue. Pharmaceutical companies, both researched-based and generic, are not monolithic entities. Price controls adversely affect them in different ways. They are, however, fierce competitors providing valuable products that keep citizens healthy and able to live productive lives. Policy makers should reject destructive price controls in favor of policies that speed up drug approvals and improve patient access. In that way, they can provide an environment that allows drug makers to continue to compete and drive down prices. Elizabeth Wright, “Price Controls on Drugs: Hazardous to Your Health,” Citizens Against Government Waste, October 30, 2000, p. 1. “Hillary Clinton’s Plan for Lowering Prescription Drug Costs,” The Briefing, HillaryClinton.com, September 2016; John Graham, “Donald Trump on Drugs,” Forbes.com, March 16, 2016. “About PCMA,” Pharmaceutical Care Management Association (PCMA), pcmanet.org. Douglas Holtz-Eakin and Robert Book, “Competition and the Medicare Part D Program,” September 11, 2013, AmericanActionForum.org. David Dickson, “U.S. Health Plans Have History of Cost Overruns,” The Washington Times, November 18, 2009, p. A1. Office of Speaker Paul Ryan, “A Better Way; Our Vision for a Confident America – Health Care,” June 22, 2016, p. 36, Speaker.gov. “Is it Legal for Me to Personally Import Drugs,”; “Why Can’t I Import Some Drugs that are Approved and Sold in the United States?,” FDA, FDA.gov. Grace-Marie Turner, “Drug Importation Equals Unsafe Drugs, Mr. Trump,” Forbes.com, March 16, 2016. Robert Schuettinger and Eamonn Butler, Forty Centuries of Wage and Price Controls – How Not to Fight Inflation, The Heritage Foundation, Washington, D.C., 1978. Gary North, “The Puritan Experiment with Price Controls,” Foundation for Economic Freedom, FEE.org, May 1, 1974. Edward L. Morse, “A New Political Economy of Oil,” Journal of International Affairs, Sept. 22, 1999, p. 11. Richard Nixon, 37th President of the United States, Executive Order 11615, “Providing for the Stabilization of Prices, Rents, Wages, and Salaries,” August 15, 1971. Schuettinger and Butler, pp. 107-108. Steve Mufson, “Price Controls: Past as Health Care Prologue; Clinton Would Find a History of Failure, Unintended Effects,” The Washington Post, March 14, 1993, p. H1. Herbert Stein, Presidential Economics: The Making of Economic Policy from Roosevelt to Clinton, American Enterprise Institute, Washington, D.C., 1994, p. 186. William Tucker, “Policy Analysis: How Rent Control Drives Out Affordable Housing,” CATO Institute, May 21, 1997, p. 4. Charles Oliver, “Failure of Price Controls in ‘70s No Roadblock to Today’s Backers,” Investor’s Business Daily, May 31, 2001, p. 24. “How Gas Price Controls Sparked ’70s Shortages,” The Washington Times, May 15, 2006, p. A1. Richard Miniter, “The Oil Shortage That Wasn’t,” National Review, April 15, 1991, p. 38. President Richard Nixon, The Memoirs of Richard Nixon, Grosset and Dunlap, New York, N.Y., 1978, p. 521. Linette Lopez, “Obamacare Premiums are Going Up by an Average of 25% Next Year,” BusinessInsider.com, October 25, 2016. Rituparna Basu, “The Broken State of American Health Insurance Prior to the Affordable Care Act,” Ayn Rand Institute/Pacific Research Institute, 2013, pacificresearch.org, pp.8-9. Bob Bryan, “One of the Main Reasons Insurance Companies Are Ditching Obamacare Isn’t Going Away,” BusinessInsider.com, September 7, 2016. Carla Anderson, “Medical Loss Ratio Returns $2.4 Billion to Consumers: Insurance Carriers Sent $469 Million in Rebates to Consumers in 2015,” January 27, 2016, healthinsurance.org. “Medical Loss Ratio – What You Need to Know,” AHIP Coverage, September 19, 2012, AHIP.org. Catlin Owens, “Why Prescription Drugs Aren’t Part of Obamacare,” MorningConsult.com, March 24, 2016. Omnibus Budget Reconciliation Act, House Conference Report 101-964 (H.R. 5835), 101st Congress, Second Session, October 27, 1990; 1990 U.S.C.C.A.N 2374, p. 792. Joint Explanatory Statement on H.R. 5193, Public Law 102-585, Veterans Health Care Act of 1992, Congressional Record S. 17890, October 8, 1992; 1992 U.S.C.C.A.N. 4186, p. 26. “Medicaid Budget Initiatives,” Hearings before the Subcommittee on Health and Environment of the Committee on Energy and Commerce, House of Representatives, 101st Congress, Second Session, September 10 and 14, 1990, p. 651. “Medicaid Prescription Drug Pricing,” Hearing before the Subcommittee on Health for Families and the Uninsured of the Committee on Finance, United States Senate, 101st Congress, Second Session on S. 2605 and S. 3029, September 17, 1990, p. 29. Joint Explanatory Statement on H.R. 5193, p. 22. “Pharmaceutical Costs: A Comparison of Department of Veterans Affairs (VA), Medicaid, and Medicare Policies,” CRS Report to Congress, January 17, 2007, pp. 10-11. “2013 Comparison of VA National Formulary and Formularies of the Highest Enrollment Plans in Medicare Part D and the Federal Employee Health Benefit Program,” The Lewin Group, October 2013, pp. 1-2. Joint Explanatory Statement on H.R. 5193, pp. 27-29. The Medicaid Drug Rebate Amendments of 1992, House Committee on Energy and Commerce Report 102-384, Part 2 (H.R. 2890), 102nd Congress, 1st Session, July 15, 1991, p. 12. Stephen Parente and Michael Ramlet, “Unprecedented Growth, Questionable Policy: The 340B Drug Program,” Medical Industry Leadership Institute, Carlson School of Management, University of Minnesota, pp. 5-6. Elizabeth Wright, “How the 340B Drug Discount Program is Increasing Cancer Costs,” CAGW WasteWatcher, CAGW.org, June, 2016. “Medicare Part B Drugs: Action Needed to Reduce Financial Incentives to Prescribe 340B Drugs at Participating Hospitals,” Government Accountability Office, GAO Highlights, June 2015. “The Impact of Growth of 340B Contract Pharmacy Arrangements,” Alliance for Integrity and Reform of 340B, Summer 2014, p. 1. Letter to Ranking Member Paul Ryan, Budget Committee House of Representatives, Congressional Budget Office, November 4, 2010. Joseph A. DiMasi, Henry G. Grabowski, Ronald W. Hansen, “Innovation in the Pharmaceutical Industry: New Estimates of R&D Costs,” Journal of Health Economics, Abstract, May 2016. “Statement by Ralph G. Neas, President and CEO, GPhA, on the June 15th FDA Pubic Meeting on GDUFA,” GPhAonline.org., June 15, 2015. Michael Mezher, “FDA Unveils User Fee Rates for FY 2017,” RAPS.org, August 1, 2016. “Tracking FDA Drug Review Performance,” California Life Sciences Association and Boston Consulting Group, CalifeSciences.org, March 29, 2016. PhRMA Statement: “Prescription Drug User Fee Act Reauthorization,” PhRMA.org, July 15, 2016. Alexander Gaffeney, “On a Hiring Spree, FDA Hires Almost 1,000 New Generic Drug Regulators,” RAPS.org, January 19, 2015. “Statement by David Gaugh, Senior Vice President Sciences and Regulatory Affairs, GPhA, Regarding the Senate Hearing HELP Hearing on GDUFA,” GPhAonline.org, January 28, 2016. Zachery Brennan, “FDA Continues Steady Reduction of Generic Drug Application Backlog,” RAPS.org, July 25, 2016. “Statement by Chip Davis, President and CEO, GPhA, Regarding Medicare Costs,” GPhAonline.org, July 25, 2016. “Statement by David Gaugh Senior Vice President, Sciences and Regulatory Affairs, GPhA on the Generic Drug User Fee Amendments,” GPhAonline.org, August 31, 2016. Joseph DiMasi, Ph.D, Christopher-Paul Milne, D.V.M., M.P.H, J.D., Alex Tabarrok, Ph.D., “An FDA Report Card: Wide Variance in Performance Found Among Agency’s Drug Review Divisions,” Abstract, The Manhattan Institute, April 2014. “BEST (Biomarkers, EndpointS, and other Tools) Resource;” FDA, April 28, 2016, pp. 2-3, 10. “21st Century Cures Discussion Document White Paper,” Committee on Energy and Commerce, House of Representatives, 114 Congress, 1st Session, January 27, 2015, p. 3. “21st Century Cures Discussion Draft,” Committee on Energy and Commerce, House of Representatives, 114 Congress, 1st Session, May 13, 2015, p. 4. “Cruz, Lee Introduce RESULT Act,” Press Release Office of Senator Ted Cruz (R-Texas), Cruz.Senate.Gov, December 11, 2015. Zachary Brennan, “Cruz Calls for Major Overhaul of FDA,” RAPS.org, December 11, 2015. Rachel Sachs, “Senator Cruz’s RESULT Act Unlikely to Achieve Results,” Harvard Bill of Health blog, December 12, 2015. Henry I. Miller, M.D., “An Antidote for Escalating Drug Prices: ‘Reciprocity’ Of Regulatory Approvals,” Forbes.com, October 14, 2015. Paul Howard and Yevgeniy Feyman, “If a Drug is Good Enough for Europeans, It’s Good Enough for Us,” HealthAffairs Blog, February 14, 2014. Tracy Staton, “Sorry Gilead. AbbVie Cuts Exclusive Deal Hep C Deal With Express Scripts,” FiercePharma.com, December 22, 2014. Carly Helfand, “Merck’s ‘Aggressive’ Hep C Pricing Helps it Steal Share in Q1,” FiercePharma.com, May 2, 2016. John Wilkerson, “Use of Hep C Rx Down 40 Percent Among Medicaid Beneficiaries in 2015,” InsideHealthPolicy – Daily News, InsideHealthPolicy.com, September 26, 2016. Bill Berkrot, “New AbbVie Hepatitis C Regimen Shows High Cure Rates: Studies,” Reuters, September 16, 2016. Historical National Health Expenditures, 2014, Centers for Medicare and Medicaid Services, December 3, 2015. Howard Dean, M.D., Letter to the Editor, The New York Times, September 19, 2015, p. A18.